Experience Nature Close-Up with Our Birding Backpack Program! Note: The scheduled Saturday, March 18 Migrate to Discovery and Adventure event has been rescheduled to Saturday, April 1, due to inclement weather. While books, CDs, and DVDs are still among the Free Library’s most checked-out materials, we’re proud of the many non-traditional items our customers can borrow across the system, from ties at the Paschalville Library to musical instruments at the Parkway Central Music Department and a variety of other fun things that make you stop and say, "I didn’t know I could get that at the library!" The latest on this list are birding backpacks! These backpacks will soon be available to borrow at three neighborhood libraries: Andorra, Cecil B. Moore, and Widener! Each pack will include a pair of binoculars, maps, and a field guide. Philadelphia is a city with many parks and rich biodiversity, and our customers will soon be able to borrow the packs and see nature in a new and up-close way! The Free Library will debut the packs at a very special free event, Migrate to Discovery and Adventure, on March 18 from 10 a.m. to 2 p.m. in the park near 33rd and Oxford Streets. This is the site of the future Discovery Center on the banks of the East Park Reservoir in the Strawberry Mansion neighborhood. 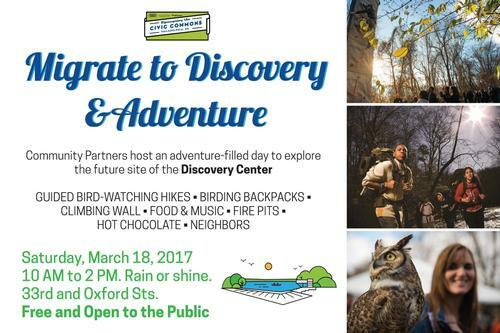 It is sure to be a fun-filled, adventure-packed day, featuring the birding backpacks, guided bird-watching tours, music, food, fire pits, hot chocolate, and a climbing wall! The Andorra Library is located at one of the highest elevations in the city and sits between the Wissahickon Valley Park and bluffs that overlook the Schuylkill River. The Upper Roxborough Reservoir is also within walking distance of the library. The Widener and Cecil B. Moore libraries are both located near East Park and the site of the future Discovery Center, an environmental education center set to open in 2018. These great neighborhood features are just a few of the great spots you can try out our binoculars! The Free Library has partnered with Philadelphia Parks and Recreation, as well as BirdPhilly, to provide ongoing related programming including lectures and guided tours. The Environmental Education Program Planner at the Wissahickon Environmental Center, Tony Croasdale, also leads BirdPhilly, which provides guided birding tours and many other wonderful resources, including an interactive map of great birding areas. The lecture series at the Andorra library is already underway! The next lecture, Birding by Sound, will take place on March 21 at 6:30 p.m. and is open to the public! The Andorra Library is also planning to offer outdoor nature storytimes in the Wissahickon Valley Park this spring. A series of programs will also take place at the Widener and Cecil B. Moore libraries. Stay tuned for more information as they hit our event calendar! 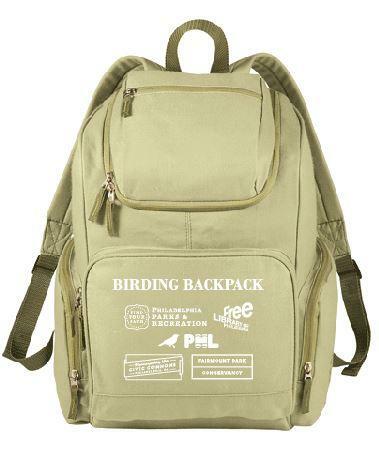 Birding backpacks will soon be available to borrow at three neighborhood libraries: Andorra, Cecil B. Moore, and Widener! Excited to learn about this project . Free Library is truly a valuable community resource in so many ways. How does someone find a list of other items available for lending through the library? This is great! Hopefully something like this can be extended into the NE Philly area. Pennypack is a large city park, and it borders many NE Philly neighborhoods. It would be such a shame if the NE wasn't able to participate in such a neat program! What a wonderful idea!! To further expand the joy of exploring outdoors I would add a couple of pieces toward the empowering experience of making where you go a little better for your having been there. I have taken to doing this on my walks and it is very satisfying to beautify a place one day's walk at a time. I highly recommend it! :) So, to each bag at the outset I would add two empty bags, one for trash taken from wherever you roam, to be later properly disposed of, and one for recyclables found that can be properly channeled toward future re-use. Start out using plastic bags, but better yet get to using reusable canvas bags that can be laundered and placed back in the pack. Some places there is sufficient litter you can't get it all, so focusing in your own particular way can make it work - like take only things that wildlife can get stuck in, like plastic yogurt containers, cans, and plastic bottles, or could cause entrapment, like pieces of string, fishing line, or old netting. Other ways to look at it is to "Take 3" -- Take and properly dispose of any three pieces of trash with each outing or "Twenty-Two" -- as in, see what two hands can do in twenty minutes of picking up before finishing your outing. Don't forget if you explore near water to cut fishing line removed into little pieces before being tossed (thrown in the trash in a tangle, it is still a wildlife entanglement hazard) or better yet send it to the monofilament maker Berkley because they recycle it and make fish habitats out of it - now what could be better than that to do with hazardous monofilament. http://www.berkley-fishing.com/Berkley-recycling.html . Don't take any more than you can comfortably carry so that your real purpose - exploring outdoors - isn't burdened beyond enjoyment. I use a carabiner attached to my belt loop to hold the bag into which I put trash items for proper disposal. Carrying the phone number of the licensed rehab nearest where you bird, in case you find an injured bird or animal and need to know the right thing to do, might also be a smart 'add' to this magical pack. Thank you Free Library for this fantastic idea, and happy adventures, and happy beautifying, to all who partake. 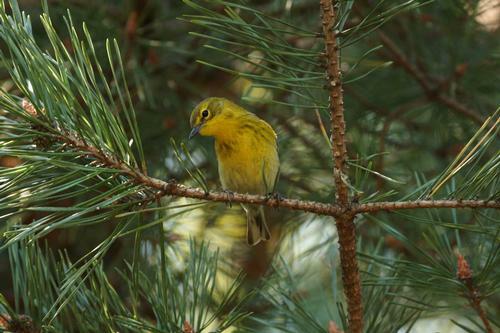 Add a Comment to Experience Nature Close-Up with Our Birding Backpack Program!